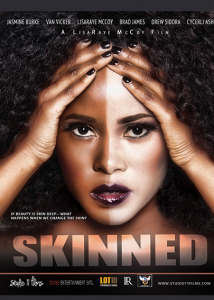 Skinned is a character-driven drama about a young lady whose insecurities about her skin color, misconception about beauty, and search for romance causes her to bleach her skin beyond recognition in an attempt to capture the heart of the perfect suitor, leads to the detriment of her health. Fast forward 10 to 15 years later, she is a beautiful model with a wonderful husband, but discovers that she's developed some complications due to the chemicals found in certain skin bleaching creams. To make matters worse, her husband discovers her damaging little secret. Now, with the assistance of a psychiatrist, Jolie must go on a journey into her past to face her demons in an effort to sustain her future.